Researchers from the team of Protein Chemistry at the University of Strasbourg demonstrated a novel approach to study molecular recognition in amyloids. The findings that have implications for the development of diagnostic tools for protein misfolding diseases are published in Chemical Science and selected by the editors to be part of the 2018 Chemical Science HOT Article Collection. Discovering molecular probes that specifically recognize distinct amyloid structures is highly important for physiological studies of protein-misfolding diseases as well as for the development of diagnostic reagents and inhibitors of amyloid self-assembly. Here, we demonstrate an approach that allows for identification of N-methylated peptides that are specific binders for a particular amyloid fiber subtype (or polymorph). 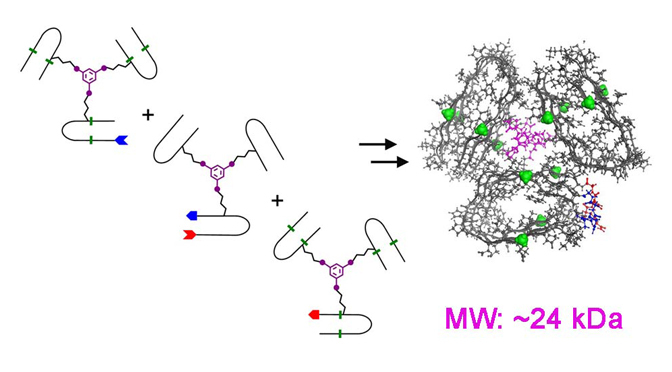 Protein design and chemical synthesis were used to produce covalently tethered amyloid analogues with molecular masses approaching 24 kDa and containing nine copies of an amyloidogenic peptide. Such engineered constructs served as a molecular testing platform to evaluate the aggregation properties and solubility as a function of N-methylation pattern. An advantage of the method is the possibility of biophysical characterization of amyloid constructs in solution.